We are thrilled that everyone who uses patterns from True Blue Quilts knows they are getting a detailed, easy-to-understand set of instructions worthy of quilters at every skill level. 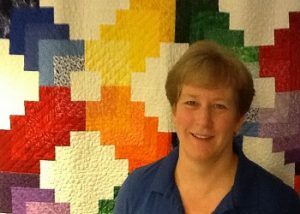 Before I created True Blue Quilts, I was a typical working mom who quilted on the weekends. Then one day I realized there are many, many quilters out there and I didn’t have to work by myself anymore. I can offer longarm services, patterns and classes that help quilters of any skill level enjoy, experiment and excel as they quilt. I was concerned that there were enough quilt pattern designers in the world already. I taught a few classes at my local quilt store and realized that my style of quilting and teaching can encourage others to express their creativity in a tangible way. I decided to create fabulous designs with easy-to-follow patterns for the adventurous quilt makers in the world. Publishers didn’t like my book ideas. No one signed up for my classes at the local quilt shop. So, I learned the process for self-publishing and took my quilt designs to the online quilting world. I was afraid no one would buy my patterns, but interest in True Blue Quilts continues to grow. Through it all, we released two books and the response has been terrific. People are excited about the designs and eager to enroll in our online quilting classes.